Content marketing isn’t just for generating leads – it can also help you support and retain customers. Image source. It takes more than coupon clippings and reward points to win over today’s consumers — they’re looking for value that goes beyond monetary incentive. Businesses that know how to engage their customers and provide unconditional value will be the ones that foster a long-term relationship with their community. This makes the pairing of content marketing and customer retention a powerful match that can’t be ignored. The growth team I lead at Outbrain, the world’s largest content discovery platform, provides a real-life case study for content and retention coming together to produce results. I’d like to share five specific content-based customer retention tactics we’re employing to grow our customer base and revenue at Outbrain – tactics you can steal for your own customer retention strategy. The sooner you educate customers about using your product, the faster they can derive value from you and become sticky. According to a survey conducted by SaaS metrics company Preact, 23% of customers churn due to poor onboarding. Especially when you have a fairly complex service, frontloading the delivery of educational content and learning from how new signups interact with this content is critical. We’ve certainly seen a direct correlation between reducing our churn and improving our onboarding process. To help our customers get acquainted with our platform and understand how our system works, we created a bootcamp training series. 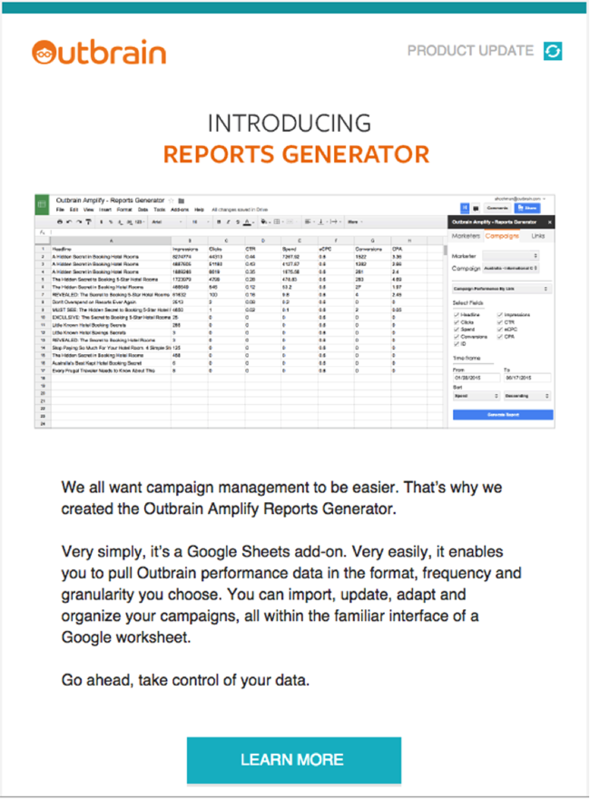 The first of four emails in our automated email training series. When we first launched our Bootcamp series, we did a test and control experiment by sending 90% of first-time customers the email program and keeping a 10% control group. For customers who received the bootcamp emails, we saw a direct correlation between content and retention. Pro tip: If you’re launching a new email campaign, exclude 10% of recipients as a control group so you can say with confidence that the customer’s actions were a result of the campaign, and they wouldn’t have taken the same actions even if they hadn’t received the emails. We dug even deeper by being strategic about which features required more education than others. For example, we knew from analyzing the overall behavior of our customers that the more headlines they are testing per individual piece of content, the better chance they have of receiving a higher click-through rate (CTR) when their content is recommended in our publisher network. This graph shows the drastic increase in CTR when a campaign has greater than 5, 10 and 15 headlines on rotation. Knowing this, we made sure our bootcamp content helped customers understand the importance of testing more headlines. As a result, those customers received higher click-through rates – and stayed active 1.5x longer than people who did not receive the bootcamp emails. Make sure your onboarding process is laser-focused on educating users on the importance of certain product behaviors you know will result in their success. Through testing, determine which features lead to a higher retention rate – and then be sure to frontload that education. If customers do well, they’re more likely to stick around longer. It’s mutually beneficial. Webinars are often discussed as an acquisition tactic, but they’re also a great way of engaging more personally with customers at scale. Nothing beats real face-time when explaining a complex product. We run bi-monthly webinars conducted by our Account Strategists. The content has evolved over time, and it’s always driven by feedback from our customers, as well as questions fielded by our Customer Support team. 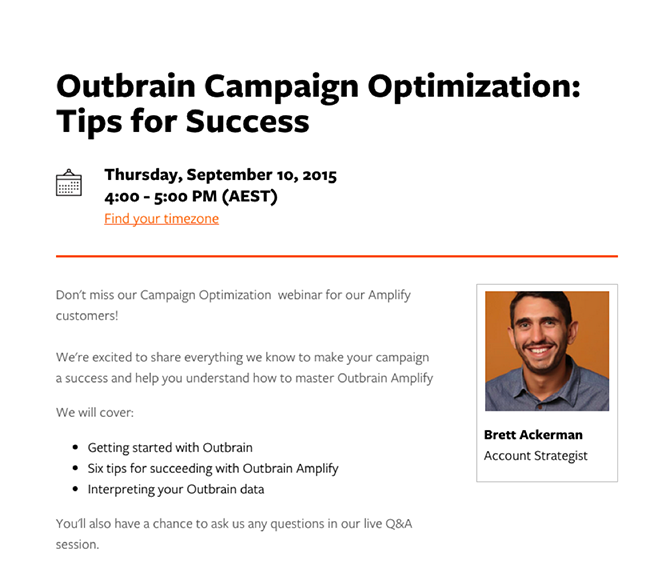 A landing page for one of our bi-weekly live webinars. We put a lot of time into adapting the content we present in these webinars, but also closely measure the webinars’ impact on our bottom line. Our Business Intelligence team built a report to compare customers’ campaign performance a week before and a week after they attend the webinar. We also look at their metrics two weeks and a month later to see if they’re continuing to optimize their performance based on webinar learnings. On average, we’ve seen a 50% increase in average spend and 38% increase in cost-per-click (CPC) as a result of these webinars. You may be thinking that increase in spend and CPC does not necessarily equal success for our customers, who are optimizing for leads and pages per visit. But due to the competitive nature of our content marketplace, a campaign that starts with a higher CPC has a much better chance of receiving any traffic at all. It’s another win-win scenario – if we can effectively explain this to customers on a webinar, they’re more likely to see results from their campaigns and they’re more likely to stick around. Use webinars to demystify your product. If you help customers succeed, they’ll help you succeed too. Not nearly enough content marketers are focused on making their help center and FAQs as useful as possible – but help centers should be a vital part of the customer journey. At Outbrain, we’ve structured our Help Center to reflect our customers’ needs from the pre-signup stage to first-time campaign creation to more advanced optimizations and reporting. New product developments that require more training and FAQs: Product releases are exciting, but the platform and its features are only as good as your ability to communicate them to your customers. It’s important to educate customers on how to get the most out of new features — create new training content and FAQs to guide them! Commonly asked questions sent to your Customer Support team: If your customer support team notices a trend in a particular topic of enquiry, that’s great fodder for new Help Center content. 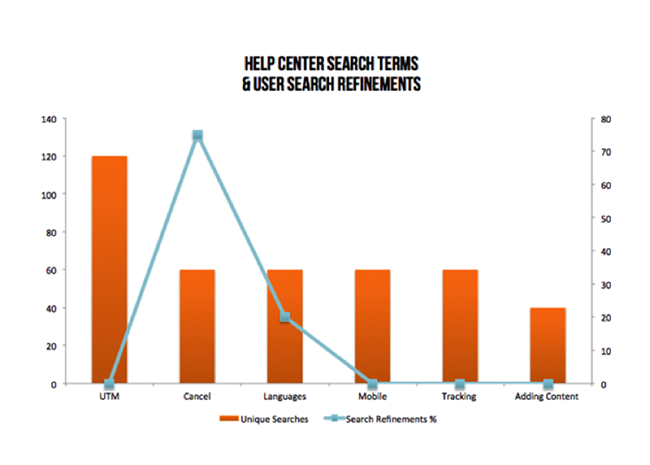 Google Analytics reports for the top Help Center search terms, search refinements made by customers and most commonly visited FAQs: For example, have a look at the chart below which shows our most commonly searched terms from 2014 and the percentage of search refinements users were making when trying to find relevant content. Customers searching for FAQs on cancelling accounts or languages were having to further refine their terms to find the content they were after, whereas customers looking for FAQs on UTMs, mobile, tracking or adding content were finding what they needed right away. We used this report to create more relevant and obvious FAQs to address these trickier searches and saw an improvement in search refinements and a reduction in questions on these topics sent to Customer Support. All of these measures help customers feel supported the entire way through their journey, and allow them to better understand your product and derive more value. And that keeps customers coming back for more. Use your search box data to understand what content your customers want but can’t find. Collaboration between content and product marketing is essential to bringing new features to customers in the most efficient way. The more educational content created around each release, the more customers will continue to engage with and provide feedback on the new feature. For us, email and our blog are our two most effective channels for sharing product updates with our customers. Our email updates are designed to alert customers to the latest developments, and then we drive them to the blog to learn more. The goal of adding this feature was to make it easier to add more headlines; a process that had been manual and very time consuming. By tracking the feature as an event in Kissmetrics, we were able to see that the average number of headlines and images per content increased significantly after our blog post and email explaining the new feature. The peak in this Kissmetrics graph shows how usage increased after we informed our audience of the new feature. The concept here is pretty straightforward: the more customers are aware of new tools and features, the more likely they are to use them. Email campaigns are still the bread and butter of many a retention marketer’s efforts. With today’s overloaded inbox, personalization of the content based on individual product usage data is now more important than ever. This is where lifecycle email marketing comes in: reaching your customers at each stage of their journey with you and tailoring relevant content to their needs and experience at each stage. Our seasonal performance email campaign is a great example of this. Historically, we’ve seen that the end of each quarter is a competitive time on the Outbrain network; more buyers and higher cost-per-click. It’s especially important to communicate that to customers so they understand how to optimize their campaigns accordingly. 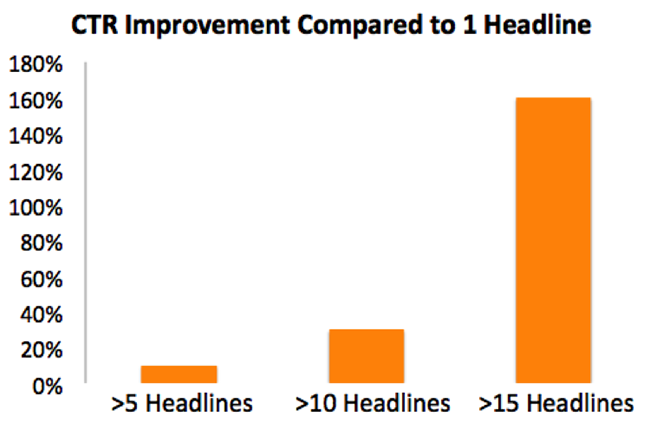 When we ran an educational email campaign for our most active customer segment about the importance of adding more headlines to increase your click-through rate (CTR), we saw a 10% increase in the average number of headlines per content campaign among those who received the email – along with an increased CTR in the most active customer segment. If you plan to prioritize customer retention as a major driver of growth and revenue for your business, investing in content will be critical to your success. 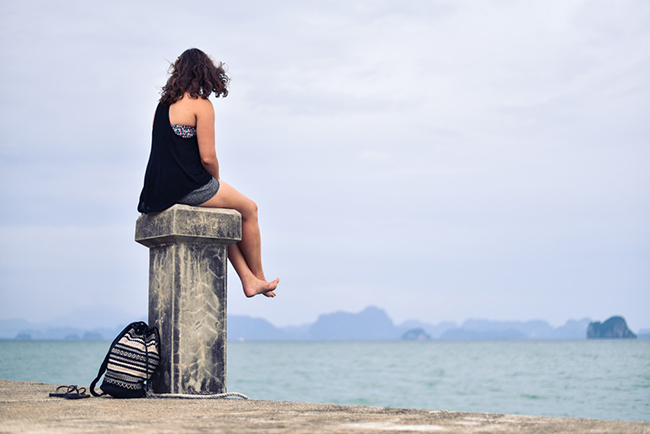 Over to you — how are you using content marketing to drive your customer retention strategy? Miko Levy is the VP of Customer Acquisition at Outbrain. Miko is responsible for the global growth and expansion of Outbrain's self-serve business, overseeing online customer acquisition, retention and account management. Miko is an avid marathon runner and coffee lover. Miko holds an MBA from Tel Aviv University and currently resides in Israel with his wife Liat, and daughter Ori.